Knife Display Magnet | BUDK.com - Knives & Swords At The Lowest Prices! 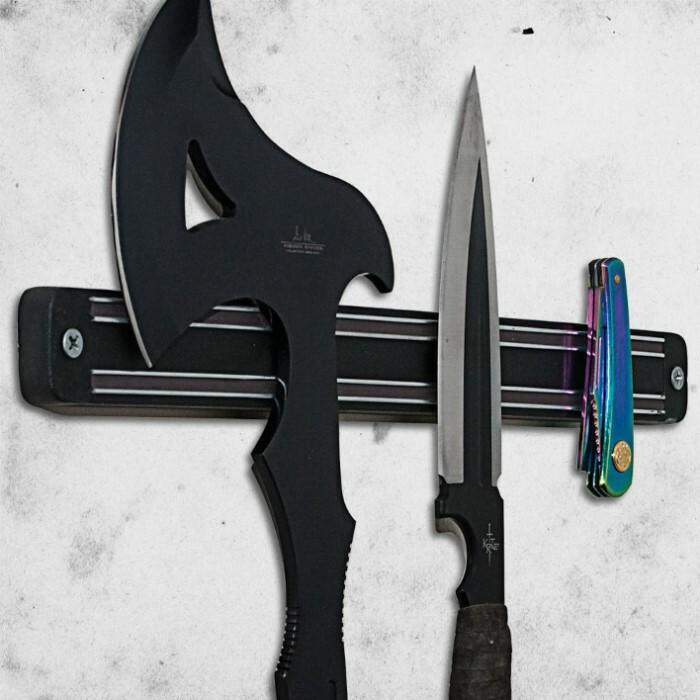 This innovative wall magnet is a great way to display your fixed blade knives or folding knives! Measuring only 13" long, it is a great space saver that allows you to proudly show off your weapons! Knives not included. Plain and simple it does the job at a very good price. Thanks trueswords! Was skeptical after reading reviews saying that these are weak, but when I tried them for myself I found them to be plenty strong, I think the problem other reviewers had was that there knives were likely stainless & what many ppl don't realize is that some grades of stainless have very little magnetic draw, I'd suggest testing the items you want to hang with a magnet before you buy these to be sure that they are magnetic, some metals are not magnetic at all (noble metals) like coins,, the only down side I've found is that it places the knives very close to the wall & knives with vary thick handles will not work unless you use a spacer in between the display magnet & the wall I used a piece of an old yardstick cut to length as a spacer & problem solved, good value for money. I tried these Magnetic Knife Displays last month. I had bought 4 of these 2 for kitchen and 2 for my truck. When I received them I was Disappointed to that the magnets in all four were very weak. I tried to stick a medium 6 inch kitchen knife to this and watched it slide off and hit the floor. It would only hold my wife's paring knife (and not very well) After learning all four were pretty much the same, I returned them to Budk, because with BudK, returns are never a problem. I will choose some other great items. Amazing display, easy to set up and has a strong pair of magnets in it. a must buy for knife enthusiasts. Somewhat disappointed as these were not strong enough to hold my bowie and folding knives. I ended up selling them to a friend to hold wrenches instead. It's amazing for three dollars lol. Seriously though. I'm expecting to hold pocket knives (if they were light enough). This thing is not only bigger than I though but can hold a full-sized weapon! Careful if you try however. Makes an easy display and probably one of the cheapest. Great quality! These are great for the price, We use them in our kitchen to hold the butcher and paring knives, so not to clutter up counter space with bulky knife blocks. 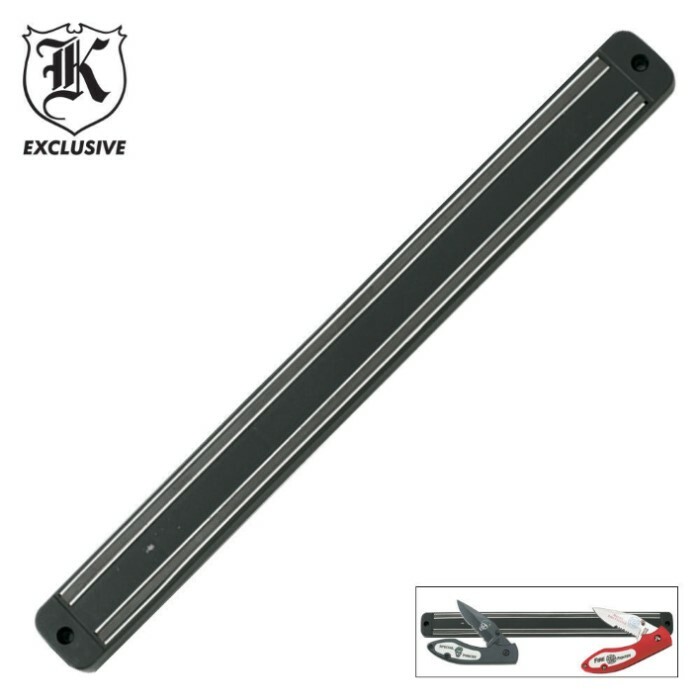 The magnets are strong and is a sturdy product, I highly recommend these for your kitchen or your collections. This makes life easier to store small metal pieces. I also use it to store my nail clipper, screw drivers and etc. It's also reasonably priced. Awesome buy! Was skeptical of them when I first got them but are very powerful. I have a life size Zangetsu from the anime Bleach and a fantasy sword heavier than Zangetsu, about 7 lbs, and it holds either of them up just just fine. These are especially good for those with cluttered walls/rooms and easily mounts the walls (screws and anchors included).